ARJUN RAINA has trained as an Actor at The London Academy of Music and Dramatic Art.Through 90's he trained as a Kathakali dancer with Guru Sadanam Balakrishanan. He is a teacher of Voice and Acting at the National School of Drama. His work in films include playing Annie in 'In Which Annie Gives it those Ones'. 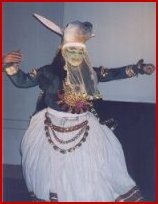 “Khelkali” is an experimental mix of Kathakali and Shakespeare. It uses the stories and text of Shakespeare and the style and theatricality of Kathakali to try and create a new authentic theatrical voice. Both were theatres emerging out of medieval morality theatre and both had storytelling at the heart of their art. With India’s colonial history as a context and its own search for a modern identity as a parameter, a combination of Shakespeare and Kathakali or Khelkali, gives a feel of a modern, contemporary India theatre. The two stories in the repertoire include ‘Othello’ and ‘A Mid Summer Night’s Dream’.